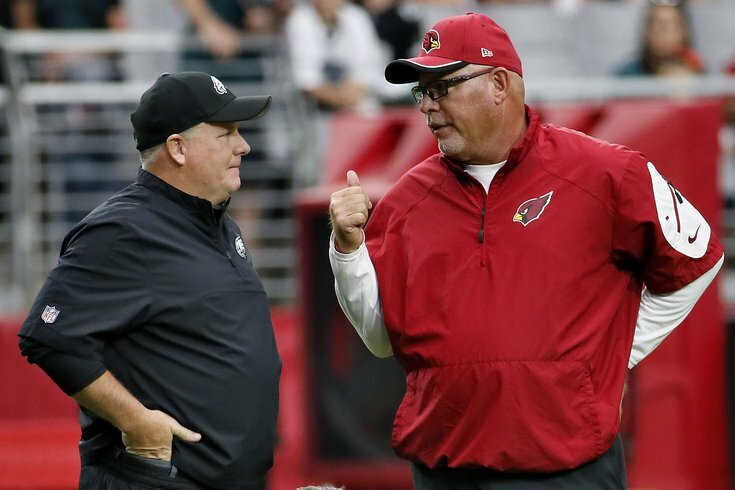 The Eagles wanted to interview Bruce Arians in 2013, but ultimately wound up with Chip Kelly. In his three-plus years as an NFL head coach, first as an interim coach in Indianapolis and then as "the" head coach for the Arizona Cardinals, Bruce Arians has been extraordinarily successful, racking up a career regular season record of 41-16. Speaking with Philly media today, Arians said the Eagles requested to interview him in 2013, but later rescinded the request. "I had an interview set up with Chicago because they had turned the paperwork in first," said Arians. "While I was in Chicago, Philadelphia, Cleveland and San Diego cancelled the interviews that we had set up." The Eagles, Browns, and Chargers did not inform him why they moved on. "I never got an answer (why they canceled), other than 'Thanks, but no thanks,'" Arians explained. "That day I was at the Bears, three of the teams decided to go in different directions. I was probably more disappointed because I thought I had the Bears job, and it was like a double-whammy." Arians said he was when he learned the Eagles wanted to interview him. "Philly is like home," he said. "Very close to home. Obviously having been at Temple, at least I knew exactly where to go back to the hospital." The Bears, Eagles, Browns, and Chargers have a combined record of 17-35 this season. *The NFL officially awards Arians' 9-3 record with the Colts to Chuck Pagano.